Rendering of the new housing project. The next step for a major housing development on Buffalo's East Side is now concrete and steel. Buffalo's Common Council approved the final stage of a $31 million People Inc. project on Jefferson Avenue. The Common Council dotted the "i's" and crossed the "t's" Tuesday for project near the Johnnie B. Wiley complex. It will be 89 units, with 79 of them considered affordable housing, in a city where there is a shortage. People Inc. Vice President of Housing Development Jocelyn Bos said the agency recognizes the need in the neighborhood. "We provide affordable housing all over Western New York and up to Rochester and this is a project that we felt is necessary in the Jefferson area to solidify the community," Bos said, "and the market is extremely strong here for affordable ranges of apartments." It has been a long path for the project, with the varied funding streams and the complicated approval process. However, construction should now start within weeks on the two buildings, with work expected to take 18 months. David Pawlik's CSS Construction is the actual contractor. Pawlik said building during this coming winter and next winter will not be a problem. "We're used to working 12 months out of the year," Pawlik said. "Most of our multi-family projects are starting in the fall due to funding sources, so this is not unusual at all. Actually, we look forward to it." The housing is less than a mile from the Buffalo Niagara Medical Campus and is likely to wind up with tenants who work there. Sponsors say it will include nice finishes like patios, dishwashers and granite countertops. "With the success of the medical corridor, you have a lot of workforce development requirements," Pawlik said. "You got folks that are going to be supporting all the development going on into the medical corridor. This is ideal, ideal. It's in close proximity, less than a mile away." The project may also house People Inc. employees who live in the neighborhood. "People Inc. has a huge number of employees that come from that area," said organization Associate Vice President Kevin Horrigan. "So we feel like this would be a good opportunity to provide some housing for our employees that come from the Jefferson community." Sinatra & Company will sub-lease the commercial space in the building for rental, with income from that going toward paying the costs of the buildings. Activists say new commercial space is also needed on the East Side. 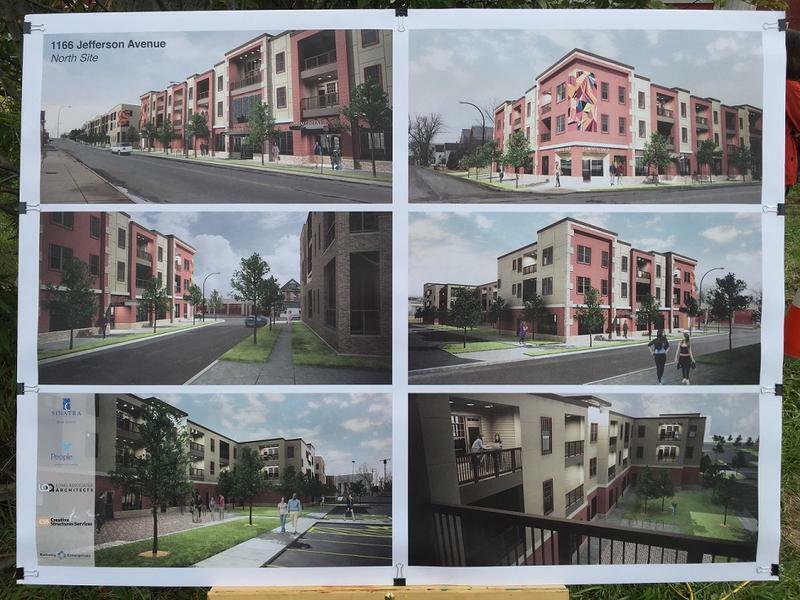 Ground was broken Monday morning on what will be two apartment buildings in Buffalo's Jefferson Avenue Corridor. Some of the apartment units will be home to people living independently with developmental disabilities.